Donald Trump has ordered a review of the Iran nuclear deal, even though it is complying with all its commitments. 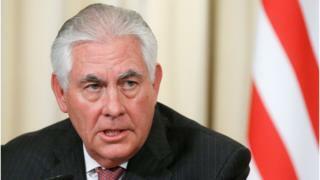 Secretary of State Rex Tillerson revealed the review, on the Obama-era decision to lift sanctions on Iran, in a letter to Congress. He acknowledged the Iranians had met the terms of the 2015 deal, but raised concerns about the country as a "state sponsor of terrorism". Mr Trump has described the landmark agreement as the "worst deal ever". However, his predecessor Barack Obama argued the deal, between Iran and six world powers including China, Russia and the UK, was the best way to prevent Iran getting a nuclear weapon. Sanctions were lifted after the International Atomic Energy Agency (IAEA) certified it had restricted its sensitive nuclear activities. In January - a year on from the deal coming into force - Mr Obama noted that, as promised, Iran had reduced its uranium stockpile by 98%. It has also removed two thirds of its centrifuges, which can be used in uranium enrichment. But in a statement, Mr Tillerson said: "President Donald J. Trump has directed a National Security Council-led interagency review of the Joint Comprehensive Plan of Action that will evaluate whether suspension of sanctions related to Iran.... is vital to the national security interests of the United States. "It remains a leading state sponsor of terror, through many platforms and methods."